This challenging tour offers you history and unspoilt nature. 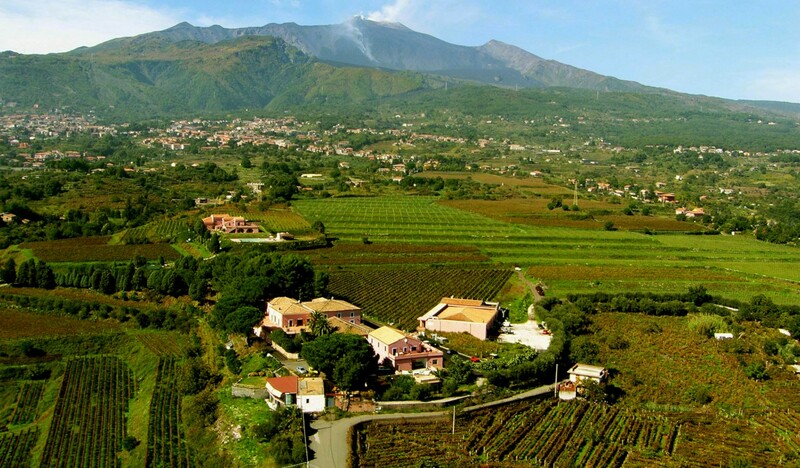 It guides you trough the baroque Southeast of the island, inland and finally to the Mount Etna, the highest active volcano of Europe. Self guided cycling Trip South East Sicily to Mount Etna. 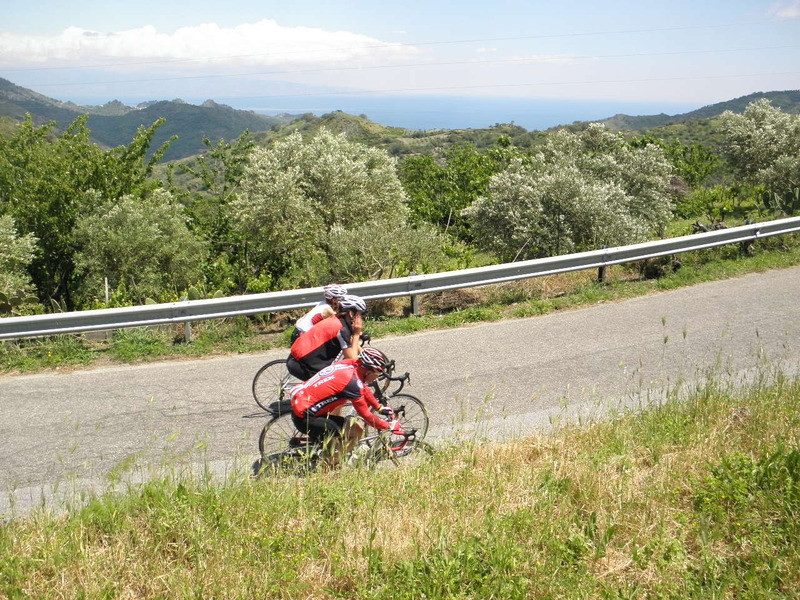 This new stunning self-guided road cycling trip starts from the Baroque South East of Sicily. 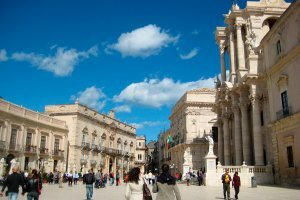 Inland you will cycle and experience the UNESCO world heritage sites like Siracusa, Noto, Modica, Ragusa, Palazzolo Acreide. Find numerous of baroque palaces and churches on your way. 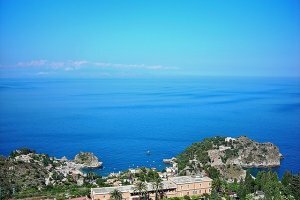 This road cycling tour on Sicily island leads you through the mountains of the South East Sicily and ends around the Mount Etna. 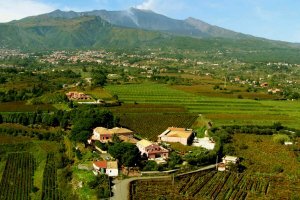 The history of Mount Etna is not only that it is one of the most active volcanos in Europe since 2011, morover it’s also the history of Eastern Sicily itself. Daily you can choose short or longer routes. Your cycle trip starts in Siracusa here you’ll cycle into the Iblei plateau with its great Canyons also called as the ”Cave”. After Siracusa you go to Sortino and here you cycle a fast downhill with some hairpins in the Anapo Valley. 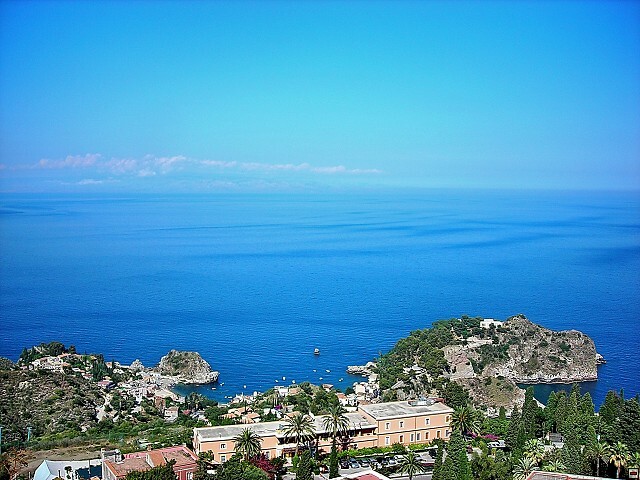 On your third day you arrive Noto which was completely destroyed after the big earthquake of 1693. Palazzolo Acreide is the next village further more you will cycle trough typical small mountain villages like Cassaro, Ferla, Sortino, Buccheri and Vizzini. The stage ends in Caltagirone. From here you cyle all the way to Valguarnera. Here you leave the plain area and cycle towards the Nebrodi mountain. 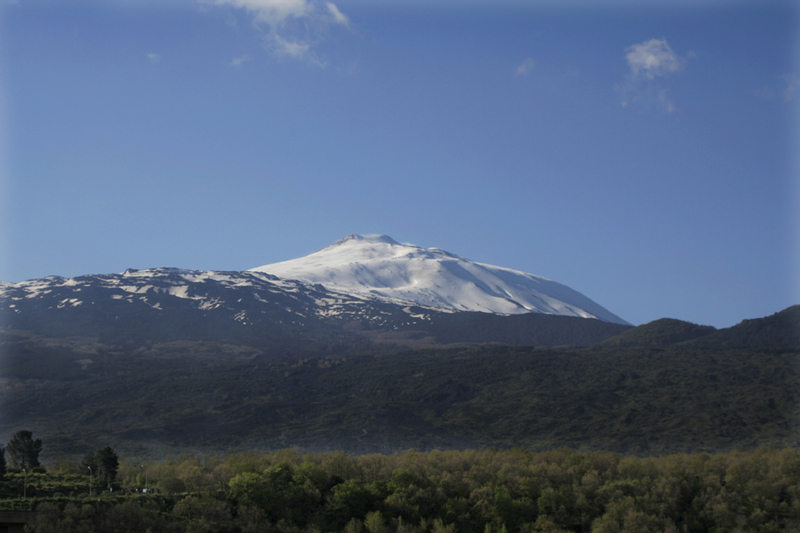 Finally you arrive at the Mount Etna that will throughout the whole day lies majestically in your sight. With a bit of luck, you will see smoke from the crater. The stage ends in Bronte, known for the vast pistachio plantations. The final stage to climb is the Mount Etna. Check in around 14.00 at your hotel in Siracusa. Introduction, bike fitting and description of the tour. After the briefing you can store your bikes or take a look at the bikes you may have rented. Today you will cycle across the Iblei plateau with its numerous Canyons, called here „cave“. After having left Siracusa you will start a climb to the Climiti mountains and then along the ridge. Shortly before arriving in Sortino you will have a stunning view over the plain of Catania and in the background the volcano Mount Etna, the goal of our tour. 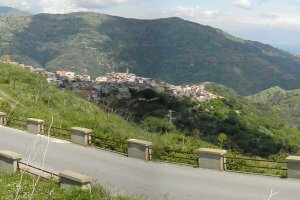 From Sortino you start the fast downhill with hairpins of the so-called „Fusco“ to the Anapo Valley. You a continuous up and down brings you to the coast, where you start the last challenging climb to the Cavagrande del Cassibile. 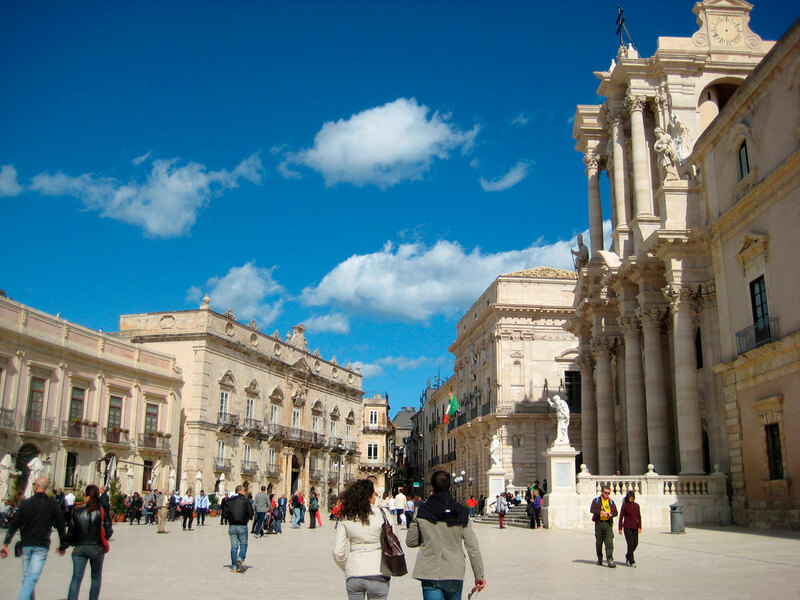 The stage ends in Noto, the capital of the Sicilian Baroque. 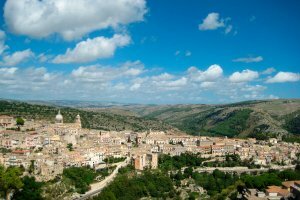 Today’s stage shows you again the various landscape of the Iblei plateau and two true jewels of baroque architecture: Modica and Ragusa Ibla. After a first climb you arrive in Noto Antica, the original city of Noto, completely destroyed by the big earthquake of 1693. You continue to Castelluccio where you start the downhill to the valley. 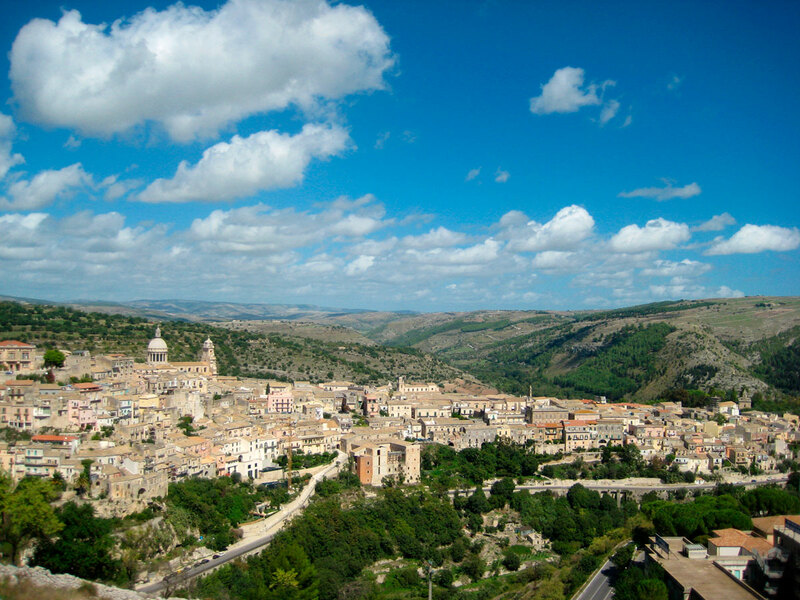 Uphill again to Modica and Ragusa, two master pieces of baroque architecture. Don’t forget to try the spicy chocolate in Modia. The stage finishes in Palazzolo Acreide. Today the route leads from the Iblei to the Erei mountains. On a continuous up and down you cross a number of typical small mountain villages like Cassaro, Ferla, Sortino, Buccheri and Vizzini. The stages finishes in Caltagirone, the center of Sicilian pottery craft. This stages continues to the center of Sicily that is of great agricultural importance and has already by the romans been described as the granary of Italy. You will see vast plantations of prickly pears. (Fico d’India). Possibility to visit the „Villa Romana del Casale“ near Piazza Armerina with the well preserved polychromatic floor mosaics. Another highlight of this stage is a long and fast downhill after Aidone. The stage ends in Valguarnera Caropepe. This stage is a big shorter so save up energy for tomorrow’s last stage. You leave the plain and cycle towards the Nebrodi mountains and finally arrive on Mt. 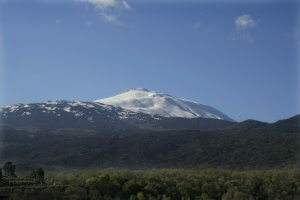 Etna that will throughout the whole day lie majestically in your sight. With a bit of luck, you will see smoke from the crater. The stage ends in Bronte, known for the vast pistachio plantations. This final stage – the circumnavigation of Mount Etna – is the highlight of every road bike tour in Sicily and with two long and difficult climbs a challenge even for ambitious road cyclist. Passing by old lava flows you will arrive at 1900 m above sea level. We also offer a shorter version on the north side of the volcano. The choice is up to you.